The Best San Francisco Bay Cruise! My new favorite SF Bay cruise: sailboats on San Francisco Bay! 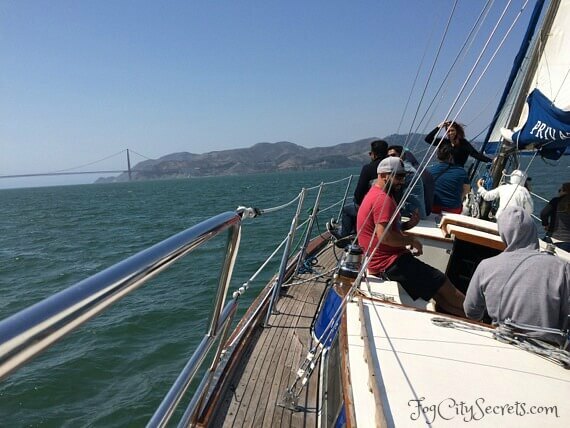 There are so many ways to get out on San Francisco Bay; it really is one of the best things to do in San Francisco. Ferries, fishing boats, speed boats, RIB boats and more. But gliding past the bridge and around Alcatraz in a sailboat may be the most fun of all! I went out for a 90-minute sail on the Privateer, one of the sailboats used by the San Francisco Sailing Company for their bay cruises. The views are spectacular! The weather was gorgeous and the winds were just right: strong enough to use the sails, but not to the point of keeling the sailboat way over. The two crew members were friendly and mellow, and the whole experience was very relaxing. 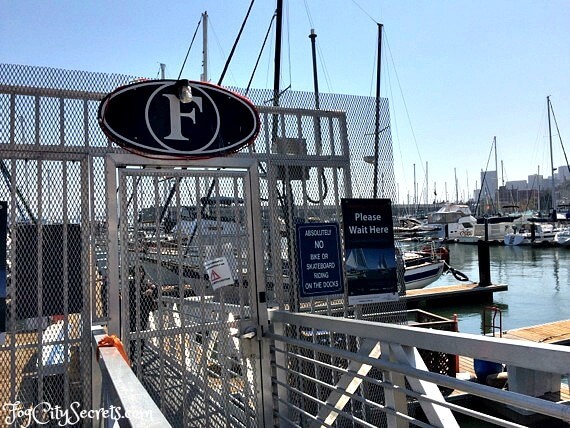 The sailboat Privateer leaves from Dock F at Pier 39 on the waterfront, on the right side of Pier 39. This is a 2-masted, 41-foot sailboat, with a small cabin (and bathroom) below deck. They hold up to 28 people, but if you avoid the busiest times, it can be far fewer, with more of the feel of sailing on a private yacht. The boat leaves promptly at the scheduled time, motoring out of the marina and heading towards the Golden Gate Bridge. 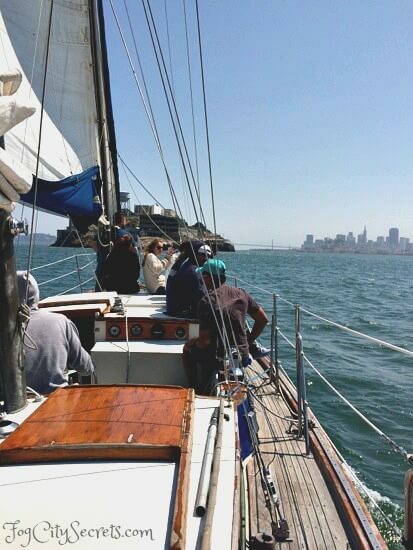 Then up go the sails and the Privateer sails towards Sausalito, goes past Angel Island and then sails for Alcatraz. 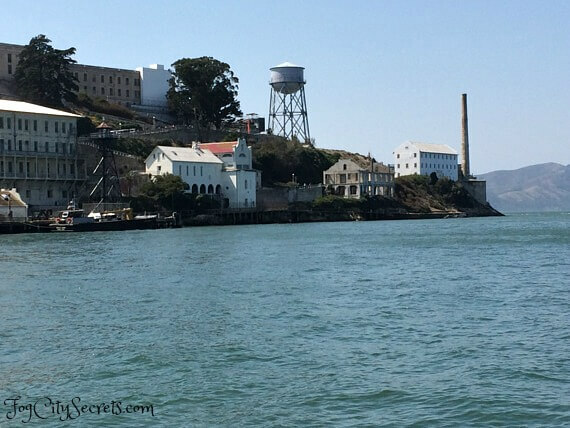 We sailed around Alcatraz Island, quite close, and got a good look at the buildings. Then we headed back towards the city with amazing views of the skyline. We were out on a sunny day and the winds were pretty calm (for San Francisco Bay). Plenty of wind to drive the boat, but no knuckle-biting steep dips towards the water! Perfect! No one got wet, either. What to Wear. I had read the Yelp comments before going, so I wore my ski jacket with a hood as recommended. Good thing, too. Even though the weather was quite warm at Pier 39 (t-shirt weather), it was much cooler out on the boat; the ski jacket was just right. I think on a cool day, gloves and a warm hat would be a good idea, too. Drinks. Guests have the option of two free drinks during the voyage: beer, white wine, sodas, or water. The crew joked about needing both hands for the trip...one to hold on to the boat and the other to hold your drink. It was definitely necessary to hold on when the boat was leaning to the side (but the railings would stop you from sliding into the sea, no worries, ha ha). Tour of the Bay. This isn't actually a "tour" in the sense of having a narrated commentary on the sights out on the bay. It's more like having a couple of nice guys taking you out on their sailboat for a leisurely cruise around San Francisco Bay, with great views of the Golden Gate Bridge, Alcatraz, Angel Island, and San Francisco skyline. Very relaxing, highly recommended. So pretty out on the water! You can see the Golden Gate during the cruise, but they don't actually go under it, or very close to it (they go under it on their weekend "Champagne and Mimosas" cruise, see below). 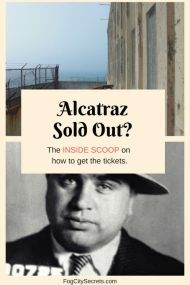 They do get very close to Alcatraz, though. We hung out just off Alcatraz island for about ten minutes, very cool. Who should go on it? They don't have an age limit, but I wouldn't bring babies or small children. They do tell you that you must have one hand free at all times to hang on, and I wouldn't want to have to hang on to a small child with the other hand. You also will need to brace yourself with your feet, as well as hang on to keep from sliding when the deck tilts. It's enough to keep yourself from sliding! Wear rubber-soled shoes. For the same reason, I wouldn't recommend this for anyone with significant mobility problems. You do have to be able to climb around on the boat while hanging on to the railing, and the boat can be tipped at a 45 degree angle at times. But if they need to swing the boom (is that what that beam is called?) of the sail around, you don't have to move as long as you're sitting down. Heads up, so to speak! But the captain and crew (two guys) are very helpful and look like they know what they're doing, so I felt very comfortable, though it was my first time on a sailboat. The Privateer sails the bay daily, 2 to 3 trips a day. The trip costs $49 per person (children $24.50), but you can often get discounted tickets. I got tickets for $27 plus fees through Goldstar.com (now $30); an amazing bargain for 90 minutes on a sailboat, including drinks! If you want to sail with them, first check to see if Goldstar has discounted tickets available, for this cruise (or their other two cruises described below). It's free to sign up, then see what they have. See Goldstar.com. If Goldstar doesn't have tickets for the dates you want, you can also book it here. The Privateer also goes on a 2-hour Sunset Cruise, seven days a week at 5:30 p.m. (4:00 pm in winter) for $65 (see booking and more info). Champagne and Mimosas Cruise. The same company has a sailing trip that takes you underneath the Golden Gate Bridge, one of those beyond-cool experiences. This cruise also sails all around the bay, with views of the Bay Bridge and Sausalito, and around Angel Island and Alcatraz. It includes two drinks: your choice of champagne, mimosas, beer, wine or soft drinks. Their 2-hour cruise happens every Saturday and Sunday at 10:00 a.m., also for $65. Unless visibility is bad, they always go under the bridge; according to the company, about 99% of the time you get to sail right under the Golden Gate! (see Goldstar for discounted tickets, or 2-hour cruise for booking and more info). What time to go? If you want a calm trip, morning or noon gives the best odds of that. The wildest one? Mid afternoon, when the winds are likely to pick up. The evening cruise should be calmer than the afternoon one because the stiff afternoon breezes usually calm down by then. But there are no guarantees, weather being what it is! 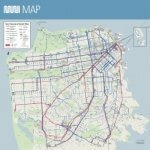 For more details about what you are likely to run into weather-wise in San Francisco in different seasons and times of day, see San Francisco weather. Pick a day with nice weather, if you can. Sunny with a gentle wind makes for the best ride. Dress warmly, even on a warm day. Layers! Don't be late; they won't wait. Hoods work better than hats in the strong winds. Rubber-soled shoes are best to resist sliding around on the deck. Sun glasses are a must, sun block strongly recommended. Do you get seasick? 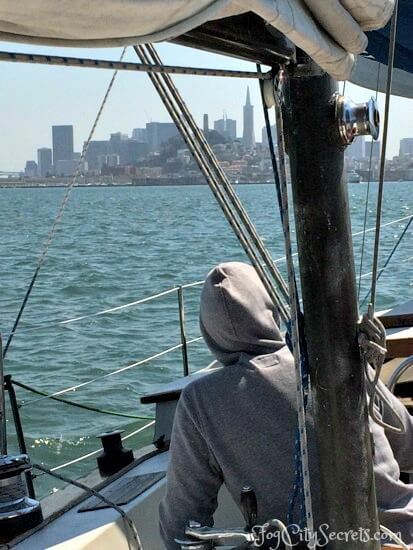 I was a bit concerned about cruising on a sailboat on SF Bay, being very susceptible to seasickness myself. The bay can be rough when the winds are blowing, which is most of the time; it's not like sailing on a lake. When I went on a whale watching cruise off Monterey years ago, I thought I was going to die! I'm happy to report that I didn't feel anything on the Privateer, in spite of the up and down motion of the boat. The winds weren't that strong the day I went out, so it might be different under more intense weather conditions. My son has the same motion sickness problems I do, and he was fine, too. Odds and ends. They do have extra jackets for passengers who aren't prepared for the cold. Also, you can put your purses, backpacks and other stuff in the cabin, so you can keep your hands free to hold on to the railing and hold your drinks;-). A drink plus a camera will require a little juggling! 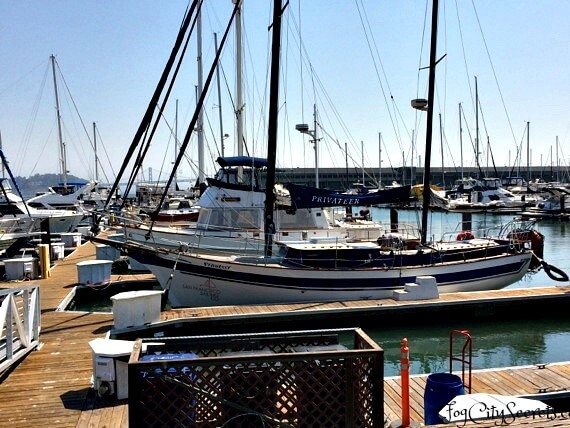 For more info on the boats and the company, see San Francisco Sailing Company. They also do private charters and give sailing lessons.